As I’m sure you’ve been able to tell, Amazons, I love asparagus. I try not to eat it too often out of season but given how short the local growing season is, I get a hankering and just can’t control myself. But asparagus season is coming, my friends, and I want you to be prepared. Asparagus is an early spring crop whose prime season is a mere few weeks. You can certainly buy imported asparagus at the store year-round, but I assure you that it can’t hold a candle to the glory of local, in-season asparagus. White asparagus is very popular in Europe, but green is the most commonly-used variety in the USA. A good source of B6, calcium, magnesium, zinc, vitamins A, C, E, K, iron, folic acid, and potassium makes this veggie one everyone should be eating! When choosing your asparagus, you want firm, smooth stalks. Make sure you check the tips for any sign of dryness or rotting. Whether you choose thick or thin stalks is up to you; for me, it depends on how I intend to prepare them. For simple pan roasting or grilling, I prefer a little thicker. I do not recommend boiling or steaming. These techniques tend to kill a lot of the natural flavor of asparagus. Dry or with a little fat is the way to go. If you don’t intend to use your asparagus immediately upon arrival at home, remove any rubber bands or twist ties, rinse, and chop off the bottom third. You could alternately use the snap technique to remove the woody bottoms: Grab either end and bend until the stalk snaps, discarding the bottom portion. Then store upright in the refrigerator in a container with water, as you would cut flowers. This should maximize storage time. To pan roast or grill, choose a fat. I usually default to olive oil but duck fat would be awesome in this application! 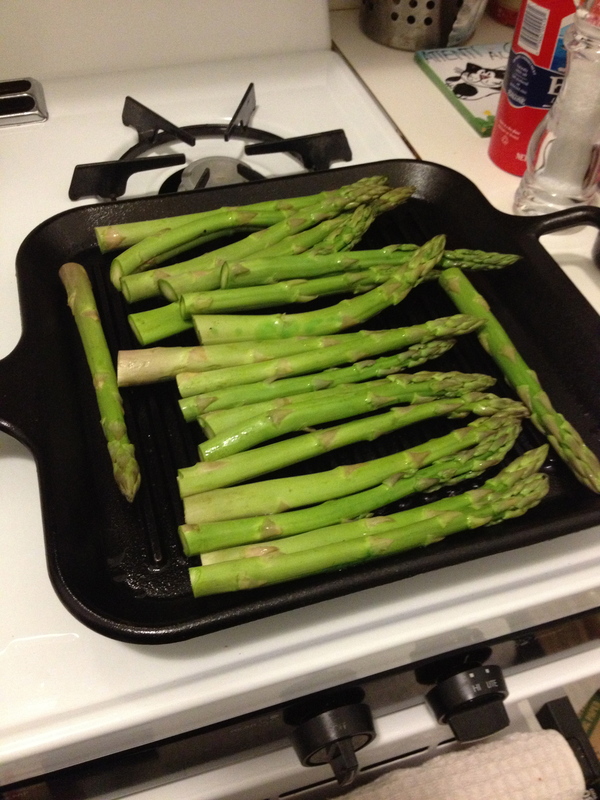 Get your pan hot, add fat, and dump in your asparagus. Give the spears time to take on color before turning with tongs. You really want them to get a little char and blistering. When they’re done, season with a touch of salt and fresh ground pepper. Maybe squeeze some lemon juice on top or sprinkle with parmesan. There are plenty of ways to season asparagus, but most of the time, I like to keep it really simple so that the natural goodness of the asparagus can emerge. Easy, simple side dish for anything. Nutritious, colorful, and tasty! Everybody get ready for asparagus season!